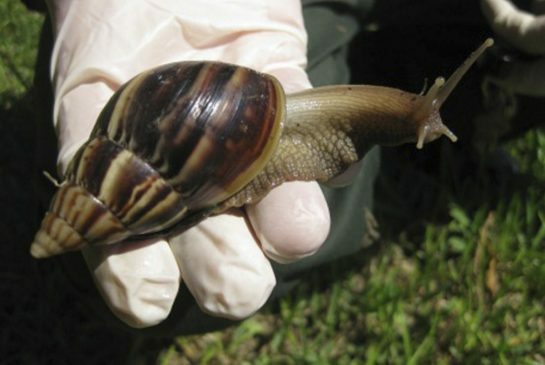 South Florida is battling a growing infestation of the giant African land snail, which is considered one of the most destructive invasive species, feeding voraciously on more than 500 types of plant. African land snail is one of the world’s largest species of snail. They can also eat through plaster walls, which provides the calcium content they need for their shells. Experts recently gathered at a science meeting in Gainesville to seek the best way of eradicating the snails. According to Denise Feiber, a spokeswoman for the Florida Department of Agriculture and Consumer Services, more than 1,000 of the snails are being caught each week in Miami-Dade county and 117,000 in total since the first snail was spotted by a homeowner in September 2011. Residents could soon begin encountering them more often, crunching them underfoot as the snails emerge from underground hibernation at the start of the state’s rainy season in seven weeks, Denise Feiber told the Reuters news agency. She added that the snails attack “pretty much anything that’s in their path and green”. In some Caribbean countries, such as Barbados, which are overrun with the creatures, the snails’ shells blow out car tyres and turn into projectiles when they encounter lawnmower blades. In addition, their slime and excrement coat walls and pavement. A typical snail can produce about 1,200 eggs a year. They have been known to carry a parasitic rat lungworm that can cause illness in humans, including a form of meningitis, Denise Feiber explained, though no such cases have yet been identified in the US. Among the solutions discussed by experts at the Giant African Land Snail Science Symposium last week, was the use of a stronger bait approved recently by the federal government. Denise Feiber said many people viewed the snails as cute pets. “They’re huge, they move around, they look like they’re looking at you … communicating with you, and people enjoy them for that,” she said. Many invasive species now live in Florida’s sub-tropical climate, including the Burmese python, which has been linked to a sharp decline in mammal populations in the Everglades region.